SFP28 Cable: Why Choose It? Over the years, our demand for communication bandwidth requirements has increased dramatically. Communication service providers, public or private data centers require higher speed and bandwidth connections. At this time, a new Ethernet connectivity standard, 25 Gigabit Ethernet was proposed. The release of the 25G Ethernet standard has provided a new path for data center server connections. This article will discuss 25G SFP28 cable and why you should choose it. SFP28 cable, also known as SFP28 DAC (Direct Attach Copper ) Twinax cable or SFP28 AOC (Active Optical Cable) cable, is a form of a high-speed cable with SFP28 connector on either end. 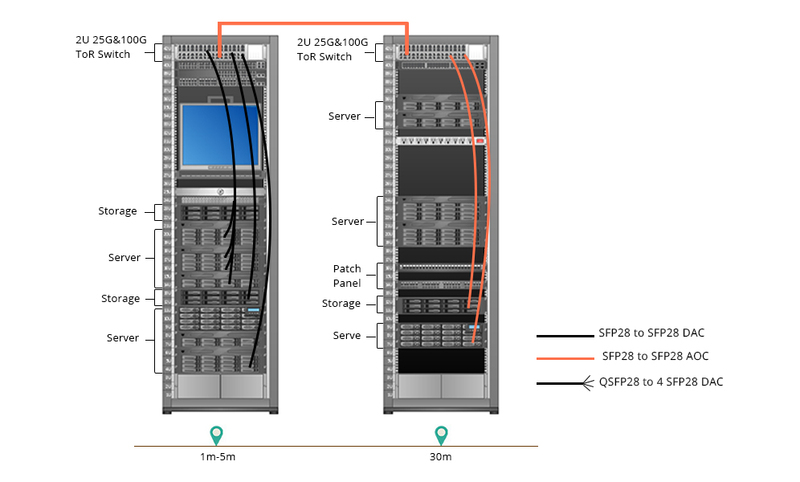 It features with lower power consumption and lower interconnection loss, which makes it suitable for TOR (Top-of Rack) switch to server connectivity. The SFP28 cable can be classified to 25G SFP28 DAC cable and 25G SFP28 AOC cable. And they are all present to be the most economical choice for TOR 25gbe switch connections. Here we will explain each cable one by one. SFP28 DAC is a form of a shielded high-speed SFP28 cable with pluggable transceivers on either end. Generally, there are two popular types of SFP28 DACs on the market, 25G SFP28 to SFP28 DAC and 100G QSFP28 to 4 SFP28 DAC. 25G SFP28 to SFP28 DAC cable is usually a passive cable on the market. It has no signal amplification in the cable assembly, so it’s often used for ultra short reach (≤5m). 100G QSFP28 to 4 SFP28 DAC uses breakout cables connect to a 100G QSFP28 port switch on one end and four 25G SFP28 ports switch on the other end, making it a highly cost-effective way to achieve short distance. Normally 25G SFP28 DAC can be used to the interconnection of switches, routers, storage devices, and servers. SFP28 AOC has a similar appearance as SFP28 copper cable, but its transmission method and application environment are not the same. There are two types of SFP28 AOCs on the market, 25G SFP28 to SFP28 AOC and 100G QSFP28 to QSFP28 AOC. SFP28 AOC uses electrical-to-optical conversion on the cable ends to improve speed and distance performance of the cable. Compared to the SFP28 copper cable, SFP28 AOC usually has a longer transmission distance and better transmission performance. Compared with the optical transceiver module, it does not have the problem of the interface being contaminated, which greatly improves the stability and reliability of the system and reduces the management costs of the server room. SFP28 AOC cable is the ideal cable for the connection between rack and rack on a data center, which is generally optimized for lengths. The development of 25G SFP28 cable connections has provided a wide range of benefits, especially in a web-scale data center environment. Primarily, SFP28 cable is suitable for short-distance cabling of a network solution, which has a scientific layout design to save space with more reasonable length. It can efficiently utilize data and switch port density. Moreover, SFP28 cable provides an extremely efficient increase in speed to the server to TOR, especially when using the DAC assembly. It also simplifies the development of interoperability specifications and systems due to the fact that it is backward compatible and gives an easier upgrade path from an existing 10G TOR server configuration. Furthermore, using 25G SFP28 cables for TOR servers are more economical. This is because SFP28 cable can provide higher port densities, fewer TOR switches and cables are needed. It allows a more cost-effective alternative TOR server connection that connects via point-to-point links. It also enables EOR (End of Row) or MOR (Middle of Row) by using structured cabling. 25G SFP28 cable solutions feature a lower power consumption and smaller footprint requirement for data centers. Due to the benefits provided by 25G SFP28 cable assembly, it is expected that it will be popular in the years to come. It is believed that the dominant next-generation server connection is towards the 25Gbps speed in the server. And in the near future, more devices will use the 25G SFP28 DAC or AOC cable assembly solutions. FS.COM offers a variety of SFP28 DAC/AOC options, such as SFP-H25G-CU3M, SFP28-25G-AOC1M and so on. You can have a visit and choose the products you need.